Charm Speedster Fire Truck. "5 - alarm" fun for your half - pint hero! Oh no! Pretend fire at the corner of sandbox and elm tree! What young boy doesnt dream of becoming a fireman? Well, this toddler-friendly Fire Truck is built around stuff that little boys just do naturally! Grab one for your own lil fire marshal, and hell be well-prepared to save younger sisters and G.I. Joes from the perils of a make-believe blaze. Quality-made, too, from heavy gauge steel, for the kind of durability that spans generations. 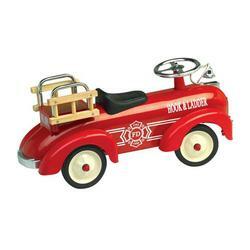 Pick up this heirloom-grade Fire Truck today and start your very own tradition!